In early October 2016, a number of news outlets, including BBC News, reported on the Scottish Government’s plans to increase the use of electronic tagging as part of the Scottish penal system. Dr Hannah Graham was quoted in many of these news reports, giving vital expert insight into the issue and providing evidence from Scotland and across Europe to show examples of best practice to improve future uses. Dr Graham was reporting the findings from two research projects she conducted with Gill McIvor, with one commissioned by the EU and one by the Scottish Government through the Scottish Centre for Crime and Justice Research. With these research projects being given such a high profile by policymakers and the media, we invited Dr Graham to be profiled for the Research and Enterprise Blog in order to share her experiences in research, and to share her work that is having impact in the field. Dr Graham is a Lecturer in Criminology in the Scottish Centre for Crime and Justice Research (SCCJR) in the Faculty of Social Sciences at the University of Stirling, Scotland. Hannah joined Stirling as a Research Fellow, moving from lecturing at the University of Tasmania, Australia in January 2015. She moved from the other side of the world to Scotland on her own, only knowing two people! She had already heard of the SCCJR, a successful multi-institutional research centre, formed in partnership between the Universities of Glasgow, Edinburgh, Stirling, Glasgow Caledonian and Strathclyde. Hannah said she feels that Scotland punches above its weight internationally in criminology, with the number and calibre of criminologists that work in this small country whose work is locally and internationally regarded. Hannah’s research interests span across a wide range of topics in criminology and social sciences, looking at how and why people stop offending and desist from crime, and how practitioners, systems and communities can support them to desist and change. Her interests also include looking at rehabilitation, probation and community justice; the sociology of punishment; the ethics of ‘innovative justice’, and uses of the arts and social innovation as catalysts for criminal justice and social justice. 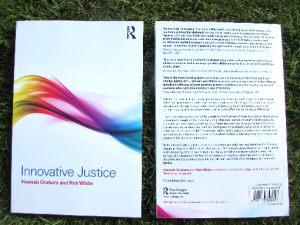 We asked Hannah what her own favourite publication is, and it is Innovative Justice – a co-authored book that she submitted to the publisher on Christmas Eve 2013 – just 5 weeks before submitting her PhD thesis! Hannah highlighted this book as one of the most inspiring pieces of work she’s been a part of, showcasing innovative justice initiatives from around the world, celebrating ‘good news’ and good practice in realising change – we’re looking forward to reading it. When we asked Hannah how she finds being a researcher at Stirling, we were delighted that she finds the research environment is collegiate and lends itself well to exploring interdisciplinary opportunities. For example, Hannah was a part of the Stirling Crucible in 2016, a professional development initiative for early career academics. She enjoyed the opportunities to learn with colleagues from very different disciplines (from aquaculture to sports coaching!). Dr Graham wearing her tag! 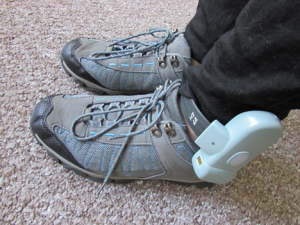 An EU funded project, Creativity and effectiveness in the use of electronic monitoring as an alternative to imprisonment in EU member states, which was a comparative cross-national study with other European countries: Germany, Netherlands, Belgium, England & Wales and Scotland. The Scottish component of this study she co-led with Gill McIvor, with the project examining how and why electronic monitoring (tagging) is used. part of the EU-funded research project, Hannah and her colleague Gill spent time interviewing practitioners and shadowing tagging officers, going into people’s homes across the countryside to observe practice as well as at the National Electronic Monitoring Centre near Glasgow. Going forward, the intention is to take their 137-page SCCJR review and 92-page EU report produced and to re-package and distil the information into a resource for practitioners with useful visual design, to concisely explain tagging and the key practice considerations in supervising and supporting monitored people in Scotland. The research partners from these five jurisdictions, including Hannah and Gill, have presented their findings at two international conferences, in London and Brussels, which attracted a range of European policy makers and practice leaders. Their comparative research outputs have been translated into French, Dutch and German. This comparative study of electronic monitoring is the first of its kind in Europe. In 2016, the findings of both of these research projects have helped inform the recommendations to Scottish Ministers in the Final Report an expert Working Group on Electronic Monitoring, as announced on Tuesday 4 October 2016 by Scottish Justice Cabinet Secretary Michael Matheson MSP. In light of these recommendations, the Scottish Government plans to introduce new legislation and change existing laws to expand the uses of tagging and to try to reduce the use of prison and remand. Following this announcement, Dr Graham was interviewed live on BBC Radio Good Morning Scotland and by Clyde 1 Radio, and her comments in the Scottish Government press announcement and other media interviews were reported widely, including by the Guardian and Telegraph, BBC News, and STV. Both the EU-funded research and the SCCJR research on electronic monitoring has attracted attention widely outwith academia, and Hannah talked about various approaches to communication and social engagement that she has used to encourage this. Hannah’s knowledge exchange goes beyond academic conferences, briefing papers & policymaking forums to social media, media contributions and participation in practitioner forums and consultations. Hannah regularly uses Twitter – managing a few twitter accounts (!) her own account, the Stirling Criminology team account and Innovative Justice account to disseminate findings, to engage students, and to contribute to cutting edge discussions in the field of crime and justice. She has also contributed to blogs and podcasts. Hannah reiterated the importance of public engagement in these ways, explaining how through such activities she builds new connections, discovers new things and keeps informed of international developments, in Europe and Australasia in particular. Hannah recounted exciting contacts made with experts in the probation and community justice through tweeting about her latest book, Rehabilitation Work: Supporting Desistance and Recovery – a tweet seen by a probation commentator in England who made contact through Twitter than wrote a book review on his widely followed blog, which was then implicated in Hannah being invited to be a keynote speaker for an international conference in Croatia! Hannah encourages others to engage in this way by contributing to impact and social media workshops for doctoral and Masters students at Stirling and as a part of SCCJR activities for PhD students across its member Universities. Tips for other researchers starting on a research career path. 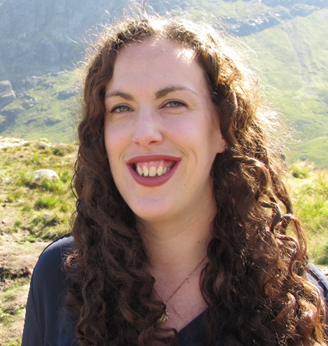 Hannah’s top tips are to encourage early career academics to be ‘citizen like’ and humble, and to ‘come bearing gifts’ in order to be known, rather than assuming entitlement to opportunities or research access because of their occupation. Hannah emphasised the value of researchers taking part in activities that involve volunteering their time, helping and learning from others in their field, for example being part of events or new initiatives led by practitioners or service users or other citizens, and not just turning up to events when they are the invited speaker. These things may not always ‘count’ in research workload planning; however, she has found that learning from practice wisdom and people’s lived experiences has been invaluable to having a sophisticated and well contextualised understanding. Some of the KE and research-related opportunities that she feels have professionally and personally been the most enjoyable have started from a process of forging common ground and, as an academic, being reflective of helping, listening, learning and value-adding – in ways that are meaningful and useful to the others involved.